Salvation And Survival: "I Will Break The Pride Of Your Power"
"I Will Break The Pride Of Your Power"
This is the warning that God gave the ancient nation of Israel should they be rebellious and reject His statutes and commandments, and break His covenant. This would be the penalty if they turned away from Him to follow after leaders who led them to worship pagan idols; and leaders who abandoned God to increase their own wealth and power; or leaders who neglected God's moral laws to serve their own lusts and flesh. You know, I've had good reason to take my eyes off the world stage for the last year or so. And it was never made clearer than what I've witnessed happening in our own nation in the past couple of months. The leaders of our country seem to have lost all sense of decorum and legitimacy. There is no respect for the duly elected President of the United States -- and whether you like him or not, the idea that it is entertainment to promote his beheading or assassination should be repugnant to every law-abiding citizen and person of faith. The fact that this repulsive image is welcomed by both media and politicians should tell you the rate of the decline of our republic. History is said to be a great predictor of the future. And as a Christian, I am appalled at the state of my nation. But I also see a clear parallel in the history of ancient Israel and Judah. The success and well-being of a nation and its citizens is greatly impacted by what kind of men are in leadership roles. Today, our leaders are more focused on secularism, consumerism, and moral relativism than Jesus's teachings and living by the principles established by God. What I am seeing in my country today is no different than what the prophet Isaiah saw during Israel's prosperous reign. He could just as easily have been speaking to us when he warned, "O My people! Those who guide you lead you astray and confuse the direction of your paths" (Isaiah 3:12). And isn't his admonishment of “Woe to those who call evil good, and good evil” (Isaiah 5:20) just as appropriate for today? Leaders make a difference in the continued survival of their nations, and the Bible records that even the nations favored by God lived or died by the influence and actions of their leaders. Both Israel and Judah had every advantage from being in close relationship with YHWH, yet their leaders ultimately led them to adopt pagan ways, to worship false gods, and to reject God's commandments. When looking at a rating chart of the Kings of Israel, it is astonishing to see that from Jeroboam to Hoshea, a matter of 207 years, they were all rated as some degree of Bad. The Kings of Judah didn't fare much better. Although Judah existed for 344 years, the reigns of its kings, from Rehoboam to Zedekiah were rated Bad, Devilish, Worst and Wicked; although six kings attempted to reform the nation and return it to God's ways, receiving a rating of Good. But, ultimately, the nations of Israel and Judah were both taken into captivity -- with the ten tribes of Israel vanishing into history. The nation of Judah was resurrected by King Cyrus and it is generally accepted that the descendants of that ancient nation are among the inhabitants of the modern nation of Israel. As I look upon the utter chaos that seems to be at the heart of governing leaders today, I want to thunder like Jeremiah, and shout at our misguided and hateful Congress. These are the leaders "who try to make My people forget My name… and cause My people to err by their lies and by their recklessness". Yes, I know that this nation is a melting pot and we are to respect and help all people try to achieve the "American Dream". But what I'm seeing now is more like a nightmare! And the fact that everything Christian is excoriated, and the ways of God are ridiculed, warns my spirit that this nation will also pay a penalty for its disobedience to the God who so richly blessed it at its founding. I confess that I am embarrassed and ashamed of how the leaders of my country are acting. It's as if all common sense and decency have left our shores. The Bible makes it very clear that the nations who obey God will be blessed. I'm afraid that our leaders have been deceived into thinking it is by their own power and abilities that we have become a prosperous nation. I'm afraid they have forgotten the statutes and commandments of our God who judges between the nations, and either raises them up or destroys them. I would advise our leaders to read Leviticus, Chapter 26 and hearken to what God says He will do to a nation that walks contrary to Him. If He was willing to execute His wrath on His beloved nations of Israel and Judah, what makes our leaders think this nation will be immune? And, yes, Leviticus is an ancient book of the Old Covenant, but for those of us who know the God of Leviticus to be the same God as today, we regard Him with Awe, Reverence, and an expectation of His Righteous Judgment. 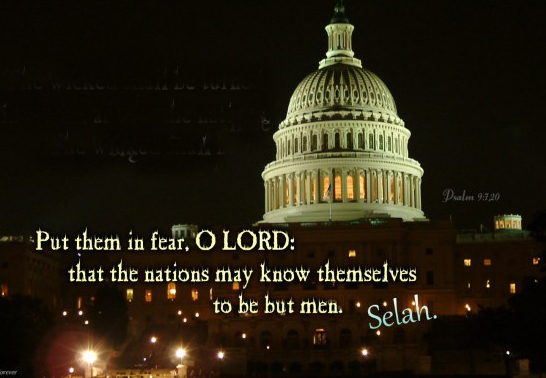 There is a definite spirit of Unrighteous Pride in our nation's capitol and I pray that corrupted minds and hearts will be renewed, so that men's pride in their own power will be broken by contrite and repentant hearts, and this land can once again walk erect with our God. I know the following Scripture is in vogue these days, but it has never been more true. Please seek His face! UPDATE: As evidenced by the violence in Alexandria, VA against members of Congress this morning (June 14), this nation is reaping what it has sowed. Among our many sins, men have become lovers of self, unthankful, unholy, without natural affection, fierce, despisers of those that are good, lovers of pleasures more than lovers of God. May God have mercy on us and hear our prayers for Godly and righteous leaders! 2 Chronicles 7:14 "If My people who are called by My name humble themselves, and pray and seek My face and turn from their wicked ways, then I will hear from heaven and will forgive their sin and heal their land". Absolutely true! There is another realm where the various ranks of satan's demons carry out our Enemy's plots and schemes to destroy mankind. Ever since we usurped his position with our Creator, the devil's goal has been to destroy us. The political and social hatred in this country (and the world) is a result of the territorial assignments given to satan's minions. You are so right --- until the Church and its leaders acknowledge the supernatural influence over this world, Christians won't even know how to pray. Sad!